Education shapes not only the future of children, but also their minds. Proper academic degrees will help them to climb the ladder of success. Increasing literacy rate of any nation is an indicator of progress. The Indian central government has implemented several schemes for betterment of students. But primary education solidifies the foundation for children. Thus, Delhi government is all set to initiate Sarvodaya school admission procedure for 2019. Scheduled Caste applicants – It has been highlighted in the scheme details that 15% of all the seats will be kept aside for students who belong to the schedule castes. Schedule Tribe applicants – To offer better educational opportunities for applicants, who belong to schedule tribes, 7.5% of total number of seats will be reserved. Physically disabled applicants – Students who suffer from any sort of physical disability, and have government certificates to prove so will also get reservation. 3% seats will be kept aside for such applicants. Reservation for Education department employees – There will be 2% reservation for those applicants whose parents work in the Education department. 1% will go to such applicants whose parents are teachers and the other 1% will be reserved for children whose parents work as ministerial workers. For nursery candidates – If the candidates are less than three years on March 31st 2019, then they will not be able to apply for this admission. For KG candidates – All such applicants, who are not under the age of four years on March 31st 2019, will be able to fill and submit admission papers to get entry in KG class. For Standard 1 candidates – All applicants, who desire to get admission in class 1, must be either 5 years in age or more as on 31st March, 2019. Age proof – As there are age related criteria for separate classes, parents need to attach proper age verification papers with the admission form. For this, applicants need to possess their legal birth certificates. Residential certificates – All applicants have to furnish their residential certificates during the time of application submission. Caste certificates – Due to special reservations for ST and SC applicants, it is mandatory for all candidates to attach a copy of their caste certificates, if they desire to get the benefit of reservations. Disability certificate – There is also a special reservation for physically handicap applicants. All such candidates must offer legal certificates, issued from government hospitals. Other reservation papers – In case the parents are associated with education department or any government ministry, then such occupational papers must also be submitted. Passport photograph – It is mandatory for applicant to attach a recent passport sized picture of the student who desires to attain admission in the school. How to get application form and how to apply? Interested parents will be able to collect the Sarvodaya admission forms online as well as offline. In case of online application, parents have to log on to edudel.nic.in. This is the official portal. Individuals can get direct access to this enrollment document by clicking on the link http://edudel.nic.in/upload/upload_2017_18/form_dt_26022018.pdf. Here, applicants will attain the digitized application form. This PDF for can be downloaded as well. If they are not interested in the online application process, then they can collect the enrollment form from the school office. It is the responsibility of the school authority to provide these admission forms to parent, without charging any fee for these. The application process is also simple. Parents can fill in the details on the digital form and submit it online. If they prefer offline application, then they have to fill the registration form, and submit it at the school. Once all applications have been submitted, Delhi government will select a date for lottery for admission. Lucky candidates’ names will be put up on the notice board of the school. Parents need to check this notice board. In case their wards’ names appear on the list, they need to prepare for the actual admission process. 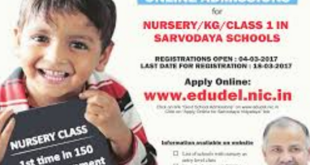 To check with the present Fee structure for Sarvodaya schools in Delhi you can check with the list of schools available on the web site. The fee structure may vary from one school to another and also depending on the location of the school. To get complete access of this online service, candidates can log on to the official website www.edudel.nic.in. Apart from this you can also log on to the official site and collect contact information regarding various designated officials along with their contact details and email ids. The website provides with information regarding officials from DOE along with their designations and names. On the website you can find intra email links to officials and their Fax numbers.